The statue of Daniel Webster that stands next to the Embassy of the Philippines on Massachusetts Avenue is largely ordinary. It’s a 12-foot bronze in the classical revival style, a stern and somber great man with his cape over his shoulder. 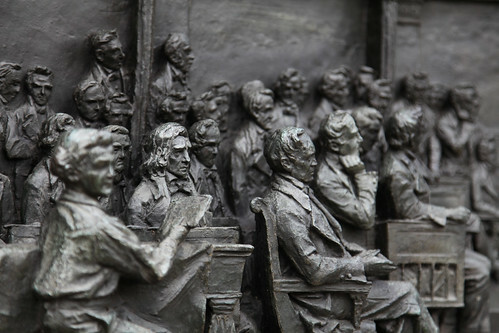 The Gaetano Trentanove bronze was presented to the United States by Mr. Stilson Hutchins, then founding publisher of the Washington Post. The Congress in 1898 would approve a $4,000 expense for the creation of a pedestal for the statue, and that’s what I found most interesting about the Webster Memorial. Two bas-relief dioramas (okay, how many of you just flashed on the shoebox dioramas you made as kids? All of you? Rock on!) 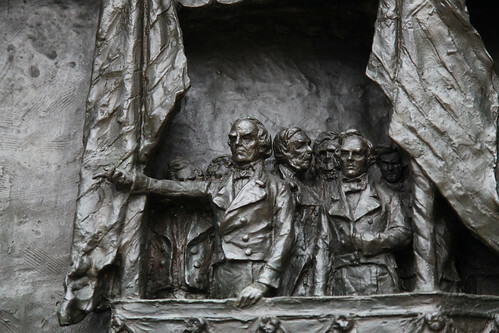 mark the east and west sides of the pedestal and are exquisite bronze representations of two seminal events in the career of Daniel Webster. 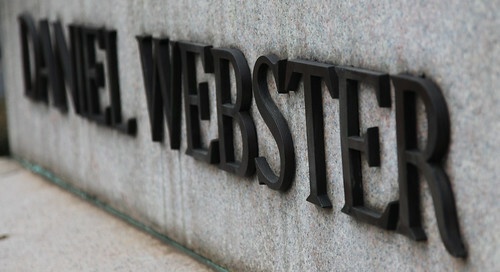 Who’s Daniel Webster, you ask? It’s okay, I didn’t remember him either. He was Secretary of State for Presidents Harrison, Tyler and Fillmore, serving two separate stints at the head of Foggy Bottom, from 1841-1843 and again from 1850-1852. He was also a Senator from Massachusetts on two occasions, and a member of the House of Representatives from New Hampshire. He was a member of the Whig Party for much of his career, having followed Henry Clay and others in its creation in opposition to President Andrew Jackson and the Democrats. Regardless, Webster is an important figure in the history of the country, and you can see him either as Devil who preserved Slavery, or as Hero who fought to preserve the Unity of the Country. Both are valid viewpoints, and I think it’s more probable that he has both sides of the argument.